Heat oven to 400°F. In food processor, place broccoli florets; pulse a few times until broccoli is finely chopped. (If you don’t have a food processor, just finely chop broccoli with knife). Unroll dough unto work surface into 1 large rectangle; press perforations and seams to seal. In small microwavable bowl, microwave cream cheese on High 30 seconds. Add garlic powder; stir until smooth and combined. Spread cream cheese mixture over dough to within 1/4 inch of one side. Sprinkle broccoli evenly over cream cheese mixture; sprinkle evenly with chicken. Place sheet of waxed paper over dough; gently press down to compress filling. Starting with side of dough opposite clean side, roll up dough to form a log; pinch seam to seal. Using sharp knife, cut roll into 8 equal slices (pinwheels); place cut side down in ungreased 8- or 9-inch round pan. In small dish, stir French fried onions and melted butter, coating onions lightly with butter. Sprinkle over top of each pinwheel. Bake 18 to 22 minutes or until pinwheels are light golden brown. Serve warm. 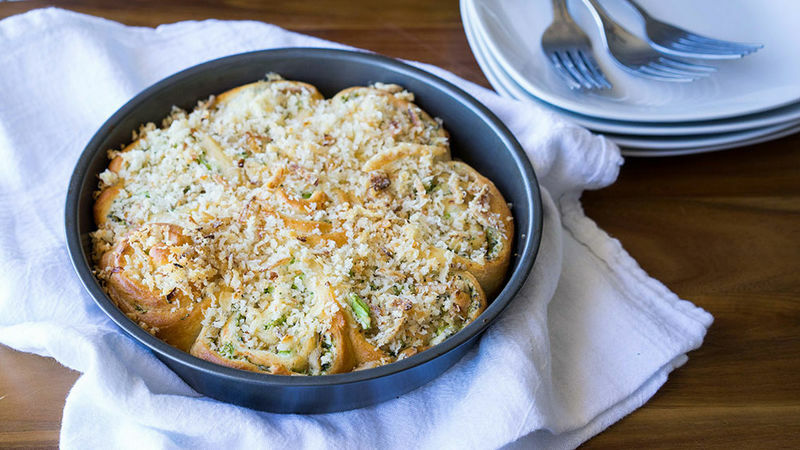 Add 1/2 cup of shredded Cheddar cheese to the cream cheese mixture for an even cheesier pinwheel. Substitute panko crispy bread crumbs for the French fried onions for a different kind of crunch.